You don’t have to visit or live on the Eastern Shore for very long before you discover the beauty of Scenic 98. As you cruise along Scenic Highway 98, you’ll drive under canopies of oak trees draped with Spanish moss. The picturesque views of Mobile Bay are breathtaking and the beautiful architecture of the homes make you realize why so many dream of calling this place their home. Just beyond the Grand Hotel Marriott, you will find one of our newest listings. 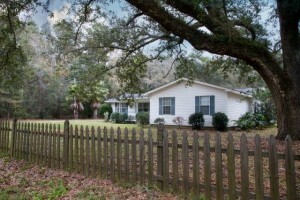 Gorgeous acreage with an older sturdy & spacious home. Located right on Scenic 98 at Bailey’s Creek, this home enjoys the convenience of the large sidewalk that stretches from for miles along Scenic 98. It is a common sight to see several people out cycling, walking and running as they enjoy the beauty of the area. This home includes 3 bedrooms and 2 bathrooms. The master bedroom is spacious with hardwood floors and a large closet. There is an en suite bathroom featuring a large double sink vanity with granite countertop and jetted tub. There is a very nice-sized rec room with tons of windows and large utility room. 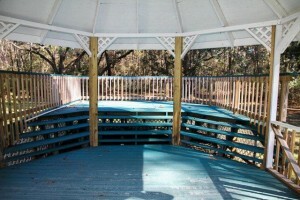 If you love to entertain, the backyard is very private with a large gazebo overlooking the back wooded acreage. The schools for this home are J Larry Newton Elementary, Fairhope Middle and Fairhope High School. They are all less than 4.5 miles from door to door. These school are very desirable and they are a major factor when buyers search for a home. 16490 Scenic Highway 98 in the historic city of Fairhope, Alabama. Fairhope is a one of a kind place that for years has attracted people from all over the country to come to make her their home. It is a vibrant town that lies on the Eastern Shore of the Mobile Bay, Fairhope is well known for it’s artistic appeal and incredible sense of community. It will not take you long to notice the lovely flower gardens on every corner and the smiles from the local proprietors as they welcome you in. It seems like there is always something to come and be a part of in Fairhope. From the multiple Mardi Gras parades, to the Fairhope Arts & Crafts Festival in March, to the downtown New Year’s Eve Celebration and all that is in between, there is rarely a time when there isn’t a celebration on the horizon. If this property sounds like it may be a fit, please contact us at 251.533.3277 to setup a showing.